Tá grianghraif ar suíomh na scoile a tógadh le linn an chéad théarma seo. Is féidir leat cliceáil anseo chun iad a fheiscint. Bainigí taitneamh astu! We have shared some photos on the school website that were taken during this first term . You can view them by clicking here . Enjoy! Is inniu lá dheirneach Múinteóir Áine Ní Fhíobhra sa scoil. Tá sí tar éis post a fháil I Luimneach. Táimid ana bhuíoch leí as an obair ar fad atá déanta aici anseo le cúpla bliain anuas. Guímíd gach rath uirthi ( best of luck) ina bpost nua. Beidh agallaimh (interviews) le haghaidh phost Áine againn go luath i mí Eanáir. Beidh múinteoir sealadach sa phost ón 5ú Eanáir 2015 afach. (We will have a temporary teacher in place from the 5th). Beidh faoistin ar siúl Dé Luain seo chugainn 22/12/14 ar a 7.30i.n. sa séipéal. Seo mar cuid den ullmhúcháin don Cóineartú agus caithfidh gach páiste a bheith ann. All children in Confirmation Class should attend Confession in the church next Monday 22/12/2014 at 7.30pm as part of their preparation for Confirmation. Dea-séal daoibh, tá an dul chun cinn déanta againn maidir leis an trácht / páirceáil lasmuigh don scoil. Beidh obair ag tosnú ar an Drop-Off zone go luath i mí Eanáir. Beidh bhúr gcomhoibriú ag teastáil uainn le linn an stáid seo. Gach rud ag dul go maith táimid ag súil go mbeidh tarmac á chur ar an zone i rith an bhriseadh Meán- Téarma i mí Feabhra 2015. Tá dul chun cinn déanta leis maidir leis an gcosán a leathnú. Táimid ag déileáil le cúrsaí dlí ina leith faoí láthair. Tá próiséas ceart le leanúint agus táimid ag bogadh ar aghaidh ar an bpróiséas seo. Ní bheadh an obair seo ag dul ar aghaidh gan bhúr dtacaíocht leanúnach. Tá €10,000 bailithe ag coiste na dtuismitheoirí go dtí seo. A leithéad d'aocht! Mo bhuíochas le Cathaoirleach agus baill an ciste na dtuismitheoirí, na reps ranga agus libhse tuismitheoirí na scoile a bhíonn ag tacú linn i gconaí. Tá sé go hiontach dea-scéal a scaipeadh ag an tam seo don bhliain! Go phearsanta tá súil agam go mbeidh Nollaig álainn agaibh go léir ague mo bhuíochas ó chroí libh as bhúr dtacaíocht i mbliana. 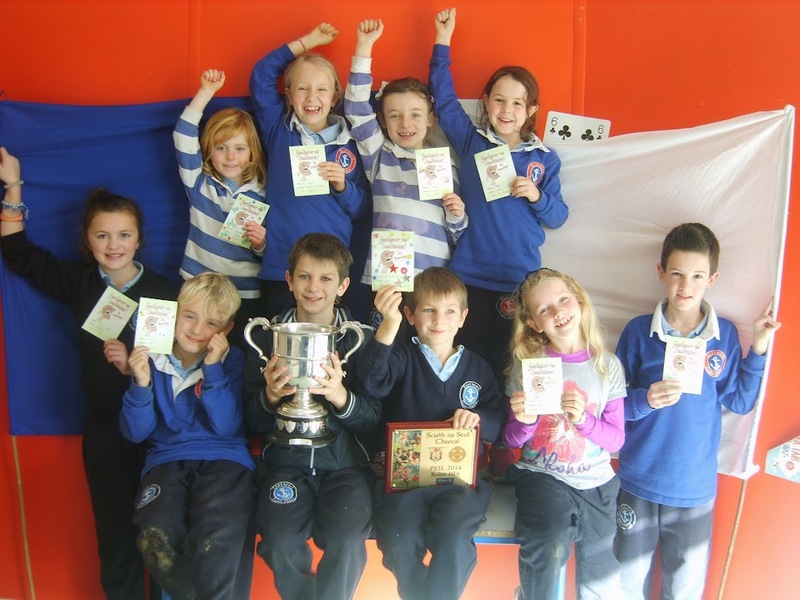 Le cúnamh Dé beidh 2015 mar bhliain iontach eile do Ghaelscoil Chionn tSáile. Good news for you. We have made great progress with the traffic/parking issue. Work will start on the Drop-Off zone early in January. We will need your cooperation during this construction stage. All going well, we are hoping to put tarmac on the zone during the mid-term break in February. There is also progress to report in regards to the widening of the footpath. We are following a legal and statutory process and final negotiations are now being worked upon. This work won't be going ahead without your continuing support. The Parents Association have gathered €10,000 up to now. What an achievement! My thanks to the chairperson and treasurer ot the Parents Association, the class reps and to you, the parents of the school, who are always supporting us. It is great to be spreading good news at this time of year. 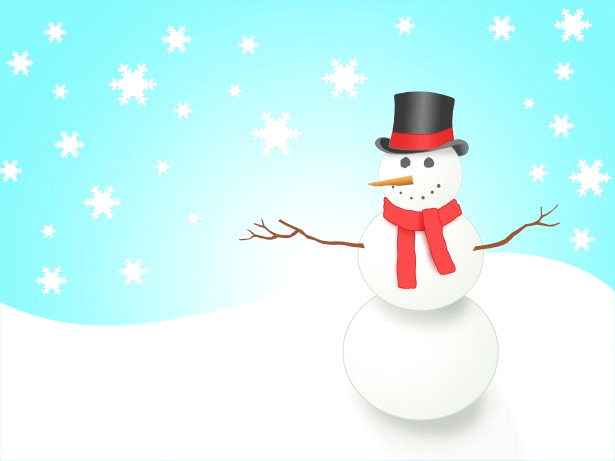 Personally, hope you will all have a wonderful Christmas and my heartfelt thanks to you for your support this term. I hope that 2015 will be another fantastic year for Gaelscoil Chionn tSáile. Tá fáilte ag na páistí gléasadh suas in éadaí Nollag ar an Aoine seo 19/12/14. Pupils are welcome to dress up in festive Christmas clothes this Friday 19/12/14. D'éirigh linn €990 a thuilleamh ón Aonach Leabhar Scholastic 17/12/14! Dá bharr, tá a lán leabhair nua faighte ag an scoil. Ár mbuíochas le gach éinne a chabhraigh leis an aonach agus a cheannaigh ón aonach. 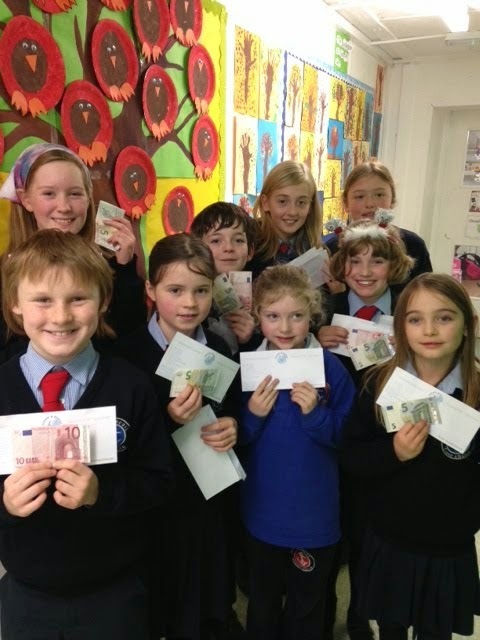 We earned a fantastic €990 from this years Scholastic Book Fair 17/12/14. 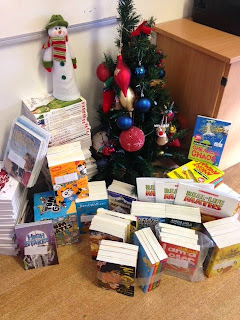 As a result, the school has been able to purchase lots of wonderful new books for our libraries. Our thanks to those who helped organize and run the book fair, as well as those who purchased from the book fair. Beidh ceithre leabhair seolta abhaile inniú 15/12/14 maidir le sábháilteacht ar an idirlíon. Tá alán obair agus caint déanta againn sa rang maidir leis an topaic seo. Ba mhaith linn go léifidh sibh na leabhair do thuismitheoirí agus go pléfidh sibh sábháilteacht ar an idirlíon agus cíbearbhulaíocht seo le bhur páistí. Four booklets on the topic of internet safety will be sent home with 6th Class pupils today 15/12/14. We have discussed these issues extensively in class and would be grateful if you could read the parents booklets and discuss the issues of internet safety and cyberbullying with your child. Beidh leath lá againn ar an Aoine bheag seo(19/12/2014). Críochnóidh na naí-ranganna ag 12.00 agus na hárdranganna ag 12.15. Tá ar an bhus scoile ag fágaint ag a 11.45. Beidh féasta / cóisir ag gach rang ar an lá. Beidh cead ag na páistí roinnt milseáin agus cluiche a thógaint isteach ar scoil. Níl cead cluichí ríomhairí / DSI's a thógaint isteach ná aon cluiche / bréagán a bheadh ró-luachmhar mar ní féidir a bheith cinnte nach mbrisfaí iad! Níl cead guma cogainte nó deochanna spraoi ar scoil. There will be a half day on Friday (19/12/2014). The Infant classes will finish at 12.00 and the older classes will finish at 12.15.The school bus needs to leave at 11.45. Every class will have a party on the day. The children will have permission to bring some sweets and games in to school. Computer games / DSI's or any expensive games/toys are not allowed because its likely that they would get broken! Chewing gum and fizzy drinks are not allowed at school. Táimid chun bailiúchán gnáth-bhianna a dhéanamh nach lobhtar go héasca, mar shampla tae, pasta, rís, pónairí, earraí stáin (torthaí - brioscaí, milseáin, rudaí deasa chomh maith!). Mar sin, seol isteach aon bhianna oiriúnacha le do pháiste, má tá fonn ort é seo a dhéanamh. Baileoidh Cumann Naomh Uinsinn de Pól iad ansan ar an 19ú Nollag 2014. We will make a collection of staple, non-perishable foods for example cereals, pasta, rice, beans, tinned goods - biscuits, sweets, nice things too!. So, if you wish to partake in this, send in any suitable foods with your children. The St. Vincent de Paul Society will collect them on the 19th December 2014. 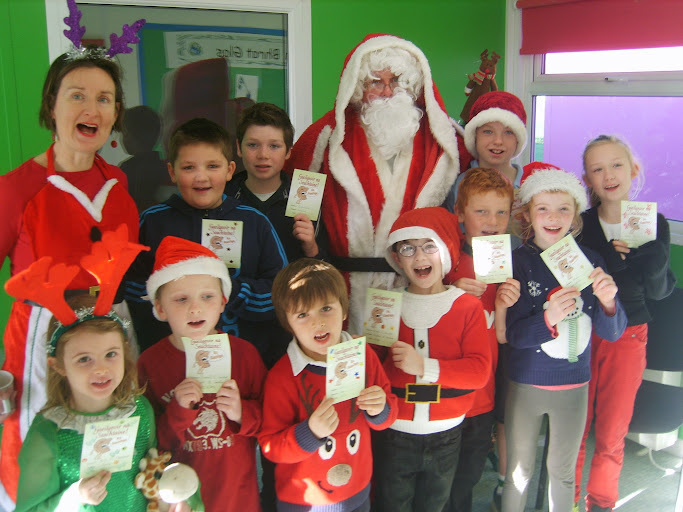 Beidh faoistin amárach (16/12/14) ag rang 3 is 4 ar scoil ag 09:30. There will be confession for third and 4th class children tomorrow (16/12/14) in the school at 09:30. Comhghairdeachas (congratulations) leis na buachaillí a bhuaigh an chomórtas grianghrafadóireachta (photography competition) don bhféilire. Ta a ngrianghrafanna le feiscint ar cúl na bhféilirí(at the back of the calendars). Tá aifreann ullmhúcháin don Cóineartú ar siúl amárach Dé Sathairn 13ú Nollag 2014 ar a 6.30i.n. Preparation for Confirmation Mass this Saturday evening 13th December 2014 at 6.30pm. Tá rang na Naíonáin Mhóra agus Rang a 1 le bheith sa Séipéal le haghaidh a 9am amárach (10/12/2014). Beidh bus á eagrú againn chun na páistí san a thabhairt thar nais ar scoil agus dos na ranganna eile go léir de bharr an droch haimsir. Ar an Déardaoin (11/12/2014) beidh ranganna Naíonáin Bheaga , Mhóra agus Rang a 1 sa Séipéal le haghaidh a 9 a.m. agus arís beidh bhus againn in ionad siúl thar nais agus dos na ranganna eile. Táimid ag súil go mór le oíche Déardaoin (11/12/2014). Tá an seó fhéin ag tosnú ag a 6. Ba chóir go mbeidh na páistí i láthair ag a 5.30. Beidh ceoltóirí na scoil ag seinm óna 5. Beidh brú spáis orainn mar sin beidh fáilte romhaibh suí thuas staighre sa Séipéal. Senior Infants and 1st Class need to be brought to the church for 9 a.m. tomorrow morning (10/12/2014). We will be organising a bus to bring those children back to school and to to transport all the other classes to and from the church because of poor weather forecasted. Junior Infants, Senior Infants and 1st Class need to be brought to the church for 9 o'clock on Thursday morning (11/12/2014) and, again,we will have a bus to bring them back to school and to transport the other classes also. We are really looking forward to Thursday night(11/12/2014). The service itself will be starting at 6 p.m. The children must be there at 5.30 p.m. The school musicians will be playing from 5p.m. There may be a shortage of space in the church on the night. You are welcome to sit upstairs in the vacant balconies. Dea Scéal / Great news! Comhghairdeas mór do Múinteoir Eavan a fuair geallta thar an deireadh seachtaine. Tá áthas an domhain orainn go léir faoi di fhéin agus Daniel. Tháinig an Chupa Breandán Máirtín chuig na scoile inniu an 8ú Nollaig le hOrla Finn, an timreóir iontach áitiúil. Bhí a lán ceisteanna suimiúil ag na páistí di. Sheas foireann caide baineann na scoile isteach léi le haghaidh grianghraf. Bhí bliain iontach acu siúd leis! Níl aon obair bhaile ag na páistí anocht dá bharr! The wonderful local football player, Orla Finn, came to the school today with the Brendan Martin Cup. The children had a lot of interesting questions for her. The school ladies football team stood in for a photgraph with her. They also had a big win this year. To celebrate all of this the children won't have any homework tonight. Beimid ag díol ticéidí dár gcrannchur ar an Aoine agus ar an Satharn seo, 5ú agus 6ú Nollag 2014 i Supervalu ó 9 r.n. go dtí 7 i.n. gach lá. Tá níos mó daoine fós ag teastáil uainn chun cabhrú amach. Má tá uair amháin le sparáil agat ar an Aoine nó ar an Satharn le cuir d'ainm ar liosta ar dhoras oifig na scoile. Ar mbuíochas dosna daoine atá ar an liosta cheanna. We are selling raffle tickets on Friday and Saturday December 5th and 6th 2014 in Supervalu from 9am-7pm each day. We are still short volunteers so if you can spare 1 hour on Friday or Saturday can you please sign up on the sheet on Hilda's door. Thanks to those who have already volunteered to help. Beidh blitz peile buachaillí Rang 3 ar siúl ar an nDéardaoin 4/12/14. Beimid ag fágaint an scoil ag a 10.30 agus beimid ar ais roimh 13.00. Beidh sé ar siúl in Átha an Mhaide. Tá tuismitheoir amháin uainn chun tiomáint chuig an cluiche agus ar ais. Má tá tú in ann cabhrú téir i dteagmháil le Múinteoir Róisín. Roghnaítear an fhoireann as hata toisc go raibh an méid sin suim. Tuigim go bhfuil díoma ar dhaoine a chaill amach ach beidh deiseanna eile i rith na bliana. There will be a football blitz for Third Class boys this coming Thursday 4/12/14. We will be leaving the school at 10.30 and returning before 13.00. The blitz is on in Riverstick Community Centre. We are looking for one parent to drive to and from the blitz. If you are available to help please make contact with Múinteoir Róisín. The team was chosen out of a hat as there was so much interest in the blitz. I understand that some are disappointed but there will be other opportunities during the year. Róisín Ní Mhathúna agus Ciara Ní Chonchúir. Tá an oifig an pharóiste faoi bhrú ó thaobh scoileanna éagsúla ag úsáid an séipéal agus de bharr seo tá orainn srian a chur ar ár gcleachtadh. Seo go díreach na hamanta a bheidh oraibh na páistí a thabhairt chun an tséipéal ag a 9 a.m.
Beidh na múinteoirí ag tabhairt síob anuas chuig an séipéal dóibh siúd a thagann ar scoil ar an bhus. The remaining classes, 2nd - 6th will walk to and from the church for their rehearsals. 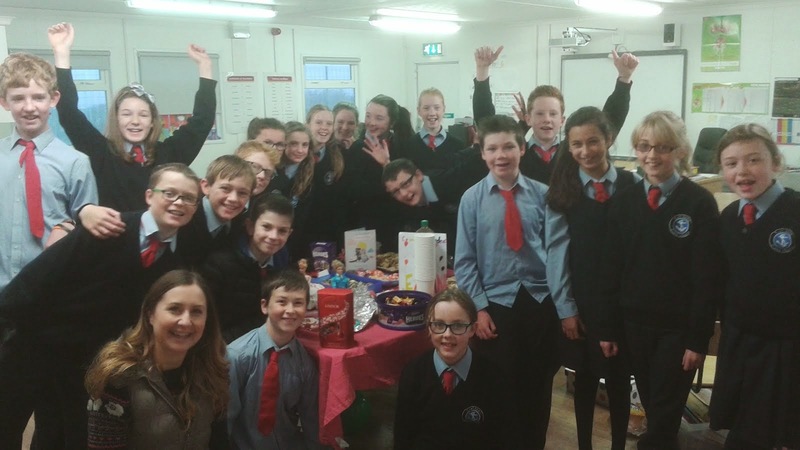 Fuair do leanbh foirm inniu (02/12/2014) faoi cead dul ar imeachtaí na scoile. Líon isteach é le do thoil agus seol thar nais maidin amárach é. Your child received a form today (02/12/2014) regarding permission to go on school outings. Please fill in the form and send it back with them tomorrow morning. Táimid ag tabhairt deis do dhaltaí na scoile a n-uirlisí a thabhairt isteach leo ar an nDéardaoin an 4ú Nollag 2014 agus an port seo a sheinm dúinn. Beidh deis acu siúd atá in ann é a sheinm go leibhéal ard seinm i ngrúpa ceoil sa tséipéal ag ár seirbhís. Mar sin bí ag cleachtadh! We are giving students of the school the opportunity to bring in their musical instruments this Thursday 4th December 2014 and to play this tune for us. Those that are able to play it to a high standard will have the opportunity to play in a group in the church at our service. Tá na Folens 'Christmas Annuals' san oifig anois!! Tágaigí istaech an t-airgead má tá fonn ort iad a cheannach - díreach cosúil le siopa! The Folens 'Christmas Annuals' have arrived to the office! Please bring in the money if you wish to buy them - just like a shop! Beidh Seirbhís & Scéal na Nollag á chur ar siúl ag páistí na scoile ar an nDéardaoin an 11ú Nollag ag a 6. Beidh ar gach pháiste a bheith sa tSéipéal ag a 5.30 ar an oíche. Beidh cleachtadh againn cúpla maidin roimh ré mar sin beidh ort do pháiste a thabhairt chuigh an tSéipéil he haghaidh a 9 a chlog ar na laethanta san agus beimíd ag siúl that nais aníos ar scoil. Beidh níos mó eolais ina leith á fháilt agaibh an Luan seo chughainn 1/11/2014. We are having a Carol Service & Nativity Drama in the our local Church on Thursday the 11th December at 6p.m. Every child has to be at the church at 5.30p.m. on the night. We will rehearse a couple of mornings beforehand. On those days will have to drop your child to the church for 9 a.m. afterwards we will walk back up to the school. You will receive further information about rehearsal dates on Monday 1/11/2014. Fé mar is eol daoibh tá se fíor dhainséarach lasmuigh do gheataí na scoile. Táimid mar scoil / Bord Bainistíochta / Coiste na dTuismitheoirí ag oibriú go dian ar réiteach a fháil agus an áit a dhéanamh sábháilte. Tá dul chun cinn á dhéanamh maidir leis an pleanáil le haghaidh 'Drop-Off Zone' nua agus an bóthar a leathnú ach is próiséas fada atá i gceist. Beidh mé ag scaipeadh update cruinn chughiabh roimh briseadh na Nollag. Idir an dá linn tá orainn na páistí a stiúrú chun a bheith aireach is iad ag teacht is ag imeacht ón scoil. Ba chóir do gach pháiste agus tuismitheoir siúl ar thaobh na lámha deise don mbóthar. Ón Luan 01/12/2014 ar aghaidh beidh mé ag cur iachall ar na páistí é seo a dhéanamh. Mo bhuíochas libh as bhur foighne is tacaíocht leanúnach ina leith. As you know it is extremely dangerous outside the school gates. We are as a school / Board of Management are working hard to come to a solution in making the area safer. Progress is being made in regards to the development of a new Drop - Off Zone and with widening the road but it is a long process. I will be sending an exact update to you before the Christmas break. In the meantime we must encourage the children to be careful as they approach and leave the school by foot. Every child / parent / guardian should walk on the right hand side of the road. From Monday 01/12/2014 on I will be advising the children to do this. Thank you for your continues patience and support with this. Going forward, when money is due for any school activity that is relevant to your children, you will receive an email message containing your payment access link. This will bring you to a parent payment page which will contain all payments requested for all siblings in a family. There is only one link per family ensuring you have the option to pay all amounts due for all your children in one transaction. Once you have completed your payment, you will be issued with a reference number. You will also receive an email receipt which will contain details of the transaction and reference number. Please quote this reference number in any queries you may have as regards this payment with the school. Beidh ceangailt ar suíomh idirlín na scoile chomh maith chun do bhille a fheiscint agus a íoc. There will be a link on the school website, also, where you can find and pay your bill. Beidh blitz peile ag cailíní Rang 3 ar an Aoine 28/11/2014. Beimid ag fágaint an scoil ag 11.30 agus ar ais roimh 14.30. Beidh an blitz ar siúl in Áth an Mhaide. Tá ochtar ar an bhfoireann agus tá an fhoireann ainmnithe. Third class girls will have a football blitz on this coming Friday 28/11/2014. We will be leaving the school at 11.30 and returning before 14.30. The blitz will be on in Riverstick. There will be 8 on the team and the team has been named. The next 'Do this in Memory' Mass is on Saturday 22nd November 2014 at 6.30pm in the Parish Church. The children should bring a fallen leaf to Mass with them, in memory of someone who has died. If parents would like someone in the community to pray for their child until their Holy Communion, have your child make and decorate a name badge and it will be placed in a basket at the back of the church. Read the Gospel reading (Matthew 25:31-46) in the last Grapevine Newsletter, it is the one that will be read at the Mass. Encourage your child to colour page 43 in their Thumb Book. Again, encourage your child to learn the responses at Mass. ·Pray and do the actions of the Sign of the Cross. ·Priest: The Lord be with you. Response: And with your Spirit. ·At the end of the Readings the response is: Thanks be to God. It would be good to arrive 10 minutes before Mass starts and to sit up near the front of the Church. The children need to bring the Thumb Book. Tá fadhbanna leis an scéim Ro-Ro atá i bhfeidhm againn. Tá gá le trácht a bheith ag snaoí isteach's amaach gan stró. Má tá ort teacht isteach sa scoil ar maidin páirceáil ag deireadh an chlóis sa tslí san níl tú ag cur bac ar dhaoine eile fágaint. We have some issues with our Ro-Ro parking system at the drop off point. Cars needs to be constantly moving in and out of the zone. Do not leave your car parked in the middle of the car park. If you need to enter the school please park your car at the very back of the car park. 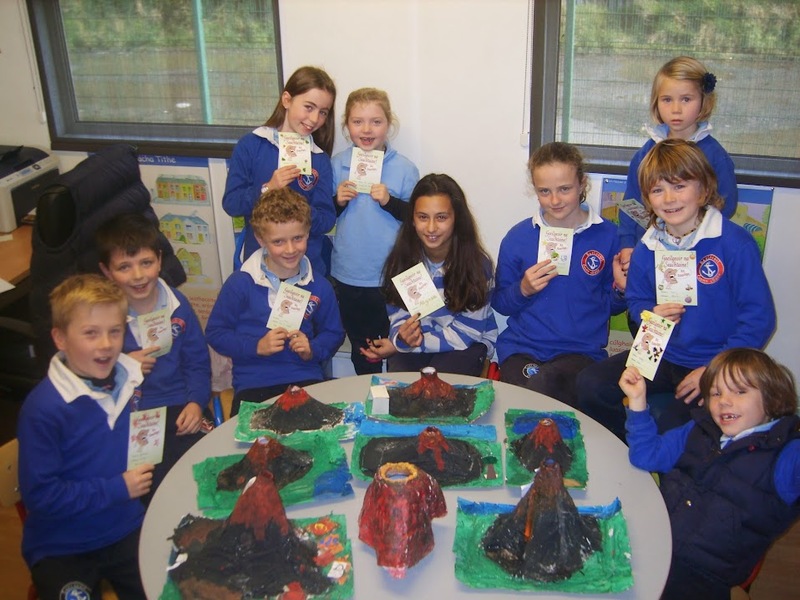 Programme, a programme available nationally to primary schools in Ireland. each day. However, many children (and adults) currently eat less than this. funds available for the purchase and distribution of fruit and vegetables to schools. the World Health Organisation (WHO) in 2006. We hope you and your child have fun with the Food Dudes! we have enclosed some Tips and Ideas below – we hope you find them useful. of fruit and veg included the better, because different fruit/veg contain different nutrients. and healthy. We hope you find the information given below helpful. of salads. A mixed salad could be put in the veg tub, to be eaten with the usual sandwiches. 􀀀 Use fruit and veg in different forms, whether cooked or raw. can be cut into sticks, and perhaps eaten with a dip. lettuce, sweetcorn, grated carrot, peas or tomato. and put in one of the lunchbox tubs. 􀀀 Keep encouraging your child to try new foods - you never know, they might like it! bhuaigh an blitz Sciath na Scol Roinn Oir Dheisceart 18/11/14. Bhí siad ag dul ó neart go neart i ndiaidh gach chluiche i mbliana agus tá sé tuillte go mór acu. Well done to the wonderful footballers in 5th and 6th class who recently competed in the Sciath na Scol Carrigdhoun blitz and won 18/11/14. after some tough matches in September. We are delighted for them. Chun chuid den phraghas an bhus agus an ceardlann eolaíochta a chlúdú, le bhur dtola, tabhair isteach €10 chugam ar nó roimh an nDéardaoin. Bíonn an-lá againn i gcónaí ann agus is baineann na páistí an-taitneamh as i gcónaí. Fágaint na scoile 9.45 r.n. Ar ais ar scoil 1.45 i.n. 4th class are going to Blackrock Castle Observatory this Thursday 20/11/14. To cover most of the price of the bus and the science workshop, please bring in €10 to me on or before Thursday 20/11/14. This is an educational, worthwhile trip and in previous years the students really enjoyed it. We will be leaving the school at 9.45am. We will be back at school at 1.45pm. Beidh blitz peile ar siúl amárach 19/11/14 ag buachaillí rang 5 agus 6 i gCarrig Uí Leighinn (tá foireann ainmnithe againn). Fágaint na scoile at a 11:00. Cluichí ag a 11:45, 12:10, 12:35 agus 1:30. There is a blitz tomorrow 19/11/14 for boys in 5th and 6th class in Carrigaline GAA Club. Leaving the school at 11:00. Game times are 11:45, 12:10. 12:35 and 1:30. Cuireadh ar an eolas mé go raibh cás míoltóga ghruaige i rang 5 agus rang 6. Scrúdaigh gruaig do pháiste anocht (18/11/2014) agus cuir an leigheas cuí air más gá. Chun na míoltóga gruaige a sheachaint chabhrófar gruaig na gcailíní a chur suas agus banda gruaige leathan a chaitheamh. Go raibh míle maith agaibh! I have been informed of a case of headlice in 5th and 6th Class. Please check your child's hair tonight (18/11/2014) and treat it if necessary. To avoid the head lice it would help to put up the girls' hair and for them to wear a wide hairband. Thanking you all in advance! Beidh léitheoireacht bheirte ag tosnú i rang do pháiste ar an Mháirt seo chughainn an 26/11/2014. ar feag leath huair a chloigh.Tá faofú ós na Gárdaí déanta ar na tuismitheoirí agus táid anois ullamh chun teacht isteach agus cabhrú linn. Tá an- áthas orainn go bhfuil é seo chun tosnú! Mar is gnáth má tá aon cheist agat téir chuigh múinteoir ranga do pháiste agus beidh siad lán sásta cainte leat. Shared Reading will commence in your child's class next Tuesday the 26/11/2014 and every Tuesday there after for a 30 minute period. The parents involved have been Garda Vetted and are ready to commence. We are delighted this scheme is going ahead and are grateful to those that are giving up their free time to do so. If you have any questions about the scheme please speak with your child's class teacher who will be more than willing to speak with you. Má tá suim ag aon cailín nó buachaill páirt a glacadh i bhéarslabhairt i bhFeis Maitiú 2015, beidh an t-airgead á bhailiú amárach, Dé Máirt 18/11/14 agus Dé Céadaoin 19/11/14. Ciallaíonn bhéarslabhairt ná labhairt na filíochta. Cosnóidh sé 16 euro an pháiste chun chuir isteach air. Cosnóidh sé 18 euro do aon páiste a rugadh sa bhliain 2003/2004. Ullmhóidh múinteoir Ciara na dánta leis na páistí ach beidh ar na tuismitheoirí iad a thabhairt ann ar an lá mar beidh sé ar siúl i rith am scoile. Ní glacfaidh an scoil le aon airgead nó iontráil a tagann isteach tar éis an Chéadaoin (19/11/14). Beidh oraibh dul i dteagmháil le Feis Maitiú sibh fhéin. Glacann siad le iontráil déanach uaireanta ar feadh tréimshe beag tar éis an spriocdáta ach bíonn an costas dúbailte. Níl aon brú ar aon páiste chur isteach ar an gcomórtas seo in aon chor. Tá a thuilleadh eolas ar fáil ar an suíomh www.feismaitiu.ie. Nó is féidir leat eolas a fháil ón na huimhireacha seo 021-4273347 / 021-4272631. If any girl or boy wishes to take part in poetry reciting (in Irish) in Feis Maitiú 2104/2015, the entrance fees are being collected tomorrow, Tuesday 18/11/14 and Wednesday 19/11/14. Entrance fee is 16 euro per child. If your child is born in 2003/2004 then the entrance fee is 18 euro. Múinteoir Ciara will prepare the children in school but parents will have to bring them to Feis Maitiú on the day as it is often on during school hours. The school will not accept ANY late entries. Parents must then contact Feis Maitiú themselves. Sometimes they accept late entries for a period after the closing date but at double the fee. There is no pressure for any child to enter in this competition. More information can be gotten from the website www.feismaitiu.ie or by calling the numbers 021-4273347 / 021-4272631. Beidh blitz peile ar siúl amárach 18/11/14 ag cailíní rang 5 agus 6 i gCionn tSáile (tá foireann ainmnithe againn). Fágaint na scoile at a 12:00. Cluichí ag a 12:30, 13:00 agus a 13:30. Cuireadh ar an eolas mé go raibh cás míoltóga ghruaige i rang 2 agus rang 4. Scrúdaigh gruaig do pháiste anocht (17/11/2014) agus cuir an leigheas cuí air más gá. Chun na míoltóga gruaige a sheachaint chabhrófar gruaig na gcailíní a chur suas agus banda gruaige leathan a chaitheamh. Go raibh míle maith agaibh! Dear parents, I have been informed of a case of headlice in 2nd and 4th Class. Please check your child's hair tonight (17/11/2014) and treat it if necessary. To avoid the head lice it would help to put up the girls' hair and for them to wear a wide hairband. Thanking you all in advance! The next 'Do this in Memory' Mass is on Saturday 22nd November at 6.30pm in the Parish Church. · Pray and do the actions of the Sign of the Cross. · Priest: The Lord be with you. Response: And with your Spirit. · At the end of the Readings the response is: Thanks be to God. Comhgháirdeachas mór le múinteoir Siobhán Ní Núnáin atá anois mar leas phríomhoide sealadach na scoile. A big congratulations to múinteoir Siobhán Ní Núnáin who is now acting Deputy Principal of Gaelscoil Chionn tSáile. Nóta tapaidh chun a mhíniú daoibh faoi na múinteoirí breise atá againn sa scoil I mbliana. Táimid ana shásta go bhfuil foireann iomlán againn anois. Beidh na múinteoirí thíos ag tógaint páistí amach as na ranganna ag oibriú leo siúd go bhfuil breis tacaíocht ag teastáil uatha leis beidh siad sna rangann I mbun Múineadh Fóirne . Beidh siad ag díriú isteach ar an uimhireacht agus ar litearthacht ag oibriú le grúpaí bheaga mar aon leis an mhúinteoir ranga. Is deis iontach é seo do pháistí na scoile. Resource : Múinteoir Máiréad (full time) & Múinteoir Jeremiah on a part time basis who is based in Minane BridgeN.S. Learning Support : Múinteoir Áine( full time) & Múinteoir Maria on a part time basis who is based in Summercove N.S. These teacher help those children that benefit from extra support both in class and in the resource rooms . Now that we have been allocated extra hours our support staff are timetabled to go into classrooms and to team teach. The support staff will work with the class teachers in teaching numeracy and literacy skills in smaller groups.This is a fantastic opportunity that will be of benefit to all our pupils. 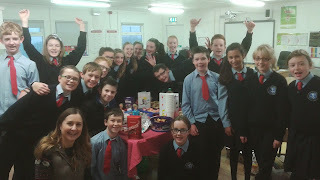 Cuireadh ar an eolas mé inniu (12.11.2014) go bhfuil cás míoltóga ghruaige sa scoil (Naíonáin Shínsearacha) Scrúdaigh gruaig do pháiste anocht agus cuir an leigheas cuí air más gá. Tá sé an-dheacair fáilt réidh le míoltóga ghruaige muna bhféachann gach clann ar gruaig a bpáistí féin.Táim ag impí oraibh seo a dhéanamh chun cosc a chur ar an fhadhb go tapaidh. I have been informed today (12.11.2014) of a case of head lice in the school today (Senior Infants) Please check your child's hair tonight and treat it if necessary. It is very hard to get rid of head lice if each family does not look at their own children's heads. I am imploring you to do this to stop the problem quickly. Aoine 14/11/14. 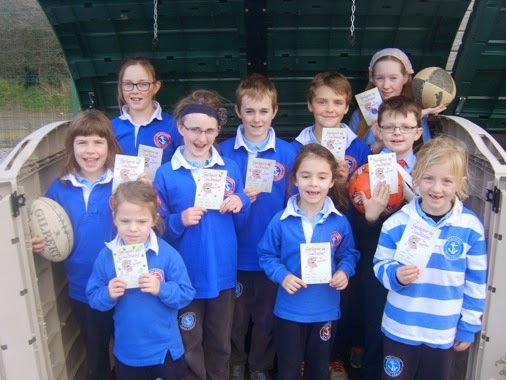 Beidh páistí R5R6 ag siúl chuig an phobalscoil agus ar ais arís i rith am scoile. Ár mbuíochas leis an bpobalscoil. 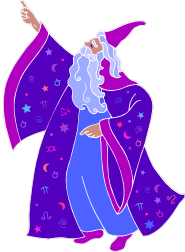 The Community School have arranged a science magician for 5th and 6th class this Friday 14/11/14, free of charge. Pupils in R5R6 will walk to and from the community school during school hours. Many thanks to the Community school. Tá Eli Lilly taréis cuireadh a thabhairt go Rang a 6 chun teacht ag féachaint ar an gcomhlacht ar an Satharn, 15/11/14 idir a 9-11, ag bualadh ag an ngeata lasmuigh ag a 9.00. Beidh siad ag oibriú sa saotharlann ag déanamh gníomhaíochtaí éagsula bunaithe ar fisic, ceimic agus bitheolaíocht. Tá siad ag lorg beirt tuismitheoir chun a bheith leis an ngrúpa. Ní bheidh múinteoir i láthair. Teir i dteagmháil le Hilda má tá sibh sásta fanacht leo. Eli Lilly have invited 6th class to their laboratory this Saturday 15/11/14, meeting at the gate at 9am and finishing at 11am. Students will be exploring physics, biology and chemistry topics and it is a wonderful opportunity. They are looking for two parents to stay with the group over the two hours. More parents are welcome. A teacher from the school will not be present. Please inform Hilda if you are willing to remain at Eli Lilly for the two hours. Tá físeán ar fáil den chluiche cheannais 05/11/14, ar phraghas €20. Má tá fonn ort é a ordú, tá Sinéad Uí Nualláin i gceannas air. Tá sé ráite anois nach féidir linn cóipeanna aonaracha a ordú. Is féidir libh clúdach litreach le d'ainm agus leis an airgead a thabhairt chuig Hilda roimh an Aoine 14/11/14 agus gheobhaidh Sinéad Uí Nualláin do chóip duit. There is a video of the football final 05/11/14 available to buy for €20. It has come to light that individual orders cannot be placed. will pass it on to Sinéad Nolan. Sinéad will place the order and distribute the DVDs once they arrive. Tá cruinniú anocht (Dé Luain) 10/11/14 sa halla measarthachta idir 7.30-8.30 ag plé camógaíocht faoi 6, faoi 8, faoi 10. There is a meeting tonight (Monday) 10/11/14 in the Temperance Hall between 7.30-8.30. The possibility of setting up a Kinsale Camogie Club for 2015 will be discussed for under 6's, under 8's and under 10's. Déanann an scoil an-iarracht i gcónaí chun Seachtain Eolaíochta a chéiliúradh. I mbliana, tá sé ar siúl idir 9-16/11/2014. Beidh gach múinteoir ag déanamh imscrúduithe agus turgnaimh le linn na seachtaine lena ranganna. Beidh múinteoirí eolaíochta Siobhán Devlin agus Orla Dockery ag bualadh isteach chugainn. Beidh Siobhán Devlin ag déanamh turgnaimh éagsúla le ranganna 1-4 agus beidh Orla Dockery ag déanamh tráth na gCeist eolaíochta le ranganna 5-6. Ár mbuíochas leo. Beidh rang a 4 ag dul chuig Blackrock Castle Observatory ar an 19/11/14. Tá féile ar siúl sa chathair agus tá a lán rudaí le déanamh mar chlann saor in aisce timpeall an chathair. Féach ar an suíomh http://www.corkcity.ie/discovery/ i gcomhair a thuilleadh eolas. We always celebrate Science Week here at the Gaelscoil and this year is no different. This year it is running from the 9-16/11/2014. Teachers will set up experiments and investigations in the classrooms. Science teachers Siobhán Devlin and Orla Dockery will visit us. Siobhán Devlin will carry out fun hands on science with ranganna 1-4 and Orla Dockery will host a science quiz for ranganna 5-6. We are very grateful to them. Rang a 4 will travel to Blackrock Castle Observatory on the 19/11/14. Ba mhaith le Fr. Young Teastas Baiste ó gach páiste atá an Cóineartú á dhéanamh acu. Más rud é go raibh Baiste an páiste déanta i gCionn tSáile, beidh an teastas acu. Más rud é go raibh an Baiste i áit eile, beidh ort é a eagrú chomh luath agus is féidir, le bhur dtola. Fr. Young needs a Baptismal Certificate for each child making their Confirmation this year. If your child was baptised in Kinsale, he will have one but if they were baptised somewhere else you will need to organise to get the certificate yourself. Tá dea-scéal agam do thuismitheoirí rang a 1 atá ag Múinteoir Áine faoi láithir. Tá múinteoir álainn nua faighte againn daoibh. Múinteoir Áine Ní Liatháin is ainm di. Tá sí ag ionadaíocht linn faoi láthair agus bhí sí linn cúpla bliain ó shin leis. Táimíd an-tógtha léi. Tá afhios agam go noirfidh sí dár Ghaelscoi álainn! Beidh sí ag tosnú an Luan bheag seo an 10ú D.F. 2104. Mo bhuíochas le hÁine Ní Fhíobhra atá mar mhúinteoir rang a haon ó tús na bliana. Beidh Áine Ní Fhíobhra mar mhúinteoir acmhainne anois don chuid eile don bhliain. I have great news for the parents of children in Áine's class! We have appointed a lovely new teacher for you! Her name is Múinteoir Áine Ní Liatháin. She is currently in the school working as a sub and has been here several times down through the years and we're absolutely thrilled with her. I know she's going to fit in so well and suit our great Gaelscoil! Many thanks to Múinteoir Áine Ní Fhíobhra who has been with rang a 1 since the beginning of the year. She will now be back working as our Resource teacher for the remainder of the year. Dea- Scéal! Beidh cupa eile ag teacht chun na scoil ar an Luan bheag seo an 10ú D.F.2014 Corn Uí Dhubhthaigh a bhuaigh foireann mBan Chorcaí sa chamogaíocht. Tá cead ag na páistí bratacht srl a thabhairt isteach leo ar an lá. Táimid ag súil go mór leis. Fantastic news! We will have another cup in the school next Monday the 10th of November 2014. We will give the O'Duffy cup which the Cork ladies Camogie team won this year a huge welcome. The children can bring in flag etc on the day, we are really looking forward it. A video recording is available of the Sciath na Scol final. Individual copies can be purchased from Mr. Brendan Barry Tel 021/4883573 or Mike English 021-4544700. Le tamall anuas táimid i mbun Féinmheastóireacht sa scoile. Bhíomar ag díriú isteach ar an nGaeilge labhartha i gclós na scoile. Déanadh breathnú/ éisteacht leis na bpáistí i mbun imirt sa chlós agus ansan thánaigh gach múinteoir suas ar sheifteanna chun feabhas a chur ar an teanga a bhí in úsáid ag a bpáistí le linn an tam a chaitheann siad sa chlós. Chun cur lenár eolais tá suirbhé curtha le chéile againn do thuismitheoirí agus do pháistí na scoile( rang a hAon aníos). Cabhróidh an teolas seo linn go mór is sinn ag cur plean feabhais le chéile. Beidh na páistí ag líonadh isteach a suirbhé le linn am scoile agus beidh Suirbhé na dTuistí ar fáil ar líne ag an nasc thíos go dtí a 12pm ar an Domhnach bheag seo, 09/11/2014. Líon isteach ceann do gach pháiste atá agat ag freastal ar an scoil. Míle buíochas libh as an tam a thógaint amach chun é seo a léamh agus an suirbhé a líonadh. I mbliana beimíd ag leanúint ar aghaidh ag cur snas ar an nGaeilge i gclós na scoile agus leis tá sé mar phlean againn díriú isteach ar Mhata Meabhrach le linn ár Féin Mheastóireacht Uimhireacht i 2015. Beidh an teolas faoi seo á sheoladh amach againn chughaibh de réir is atáimid ag dul tríd. Mo bhuíochas le múinteoirí na scoile atá ag obair go dian i gconaí ar son bhur bpáistí agus ar son feabhsú agus forbairt Ghaelscoil Chionn tSáile. We have been busy recently working on our School Self- Evaluation Plan. Last year a decision was taken to focus on the quality of spoken Irish in the school yard. The children were observed in the yard and a record was kept of the level of grammar / language each class had. As a group we analysed these findings and put an improvement plan in place for each class based on their particular difficulties. We now want your and your child's / children's input to help us on the next step of this improvement plan. We have put together a survey for parents and another for pupils (1st Class upwards). The children will be filling in their survey during school time and the parents survey is on the link below , it will be live until 12pm this Sunday 09/11/2014. Please complete a separate one for each child that you have attending the school. Many thanks to you all for taking the time to read this and to complete the survey. This year we will continue to improve upon the level of Irish spoken in the school yard. Following on from this, we are planning to focus on 'Mata Meabhrach' / Mental Maths as part of our School Self- Evaluation in 2015. A big thank you to the teachers of this school that work tirelessly for your children and towards the improvement and development of Gaelscoil Chionn tSáile.